This state-of-the-art handbook will keep researchers and practitioners in gerontology abreast of the newest theories and models of aging. The chapters in the third edition place a strong emphasis on the future of theory development, assessing the current state of theories and providing a roadmap for how theory can shape research, and vice versa, in years to come. 1. 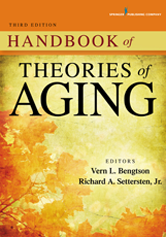 Theories of Aging: Developments Within and Across Disciplinary Boundaries - Bengtson Vern L. and Settersten Richard A., Jr.
Part I. STANDING ON THE SHOULDERS OF GIANTS: PERSONAL PERSPECTIVES ON THEORY DEVELOPMENT IN AGING: Standing on the Shoulders of Giants in Gerontology - Settersten Richard A., Jr.
5. How Theories of Aging Became Social: Emergence of the Sociology of Aging - Bengtson Vern L.
6. Social Movements and Social Knowledges: Gerontological Theory in Research, Policy, and Practice - Estes Carroll L. with DiCarlo Nicholas R.
PART II. BIOLOGICAL THEORIES AND CONCEPTS: Advances in Biological Theories of Aging - Kennedy Brian K.
7. Evolutionary Theory and Aging - Arbuthnott Devin, Promislow Daniel E. L., and Moorad Jacob A. 8. Inflammation and Aging - Xu Ming and Kirkland James L.
12. Emotion–Cognition Links in Aging: Theories and Evidence - Ngo Nhi, Sands Molly, and Isaacowitz Derek M.
13. Theories of Social Support in Health and Aging - Uchino Bert N., Ong Anthony D., Queen Tara L., and Kent de Grey Robert G.
14. Age Stereotypes’ Influence on Health: Stereotype Embodiment Theory - Meisner Brad A. and Levy Becca R.
PART IV. SOCIAL SCIENCE THEORIES AND CONCEPTS: Advances in Social Science Theories of Aging - Settersten Richard A., Jr.
16. Theories of Work and Retirement: Culture, Trust, and the Social Contract - Hardy Melissa and Reyes Adriana M.
18. Theories of Social Connectedness and Aging - Wong Jaclyn S. and Waite Linda J. 19. Long, Broad, and Deep: Theoretical Approaches in Aging and Inequality - O'Rand Angela M.
23. Theories Guiding Support Services for Family Caregivers - Montgomery Rhonda J. V., Kwak Jung, and Kosloski Karl D.
24. Theoretical Foundations for Designing and Implementing Health Promotion Programs - Hughes Susan L., Stolte Elske, and Smith-Ray Renae L.
25. Theories of the Politics and Policies of Aging - Hudson Robert B. 26. Theories of Help-Seeking Behavior: Understanding Community Service Use by Older Adults - Wacker Robbyn R. and Roberto Karen A. PART VI. TRANSDISCIPLINARY PERSPECTIVES ON THEORY DEVELOPMENT IN AGING: Advances in Transdisciplinary Theories of Aging - Bengtson Vern L.
27. Successful Aging - Rowe John W. and Cosco Theodore D.
29. Religion, Spirituality, and Aging - Coleman Peter G., Schröder-Butterfill Elisabeth, and Spreadbury John H.
32. Theoretical Perspectives on Biodemography of Aging and Longevity - Gavrilov Leonid A. and Gavrilova Natalia S.
35. Prospects for Future Theory Development in Aging - Settersten Richard A., Jr., and Bengtson Vern L.